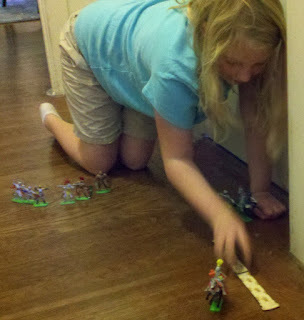 During a boring Sunday afternoon, my daugther suggested we play the new Wooden Wars game that my friend Tom developed. It's similar to HG Wells' Little Wars. 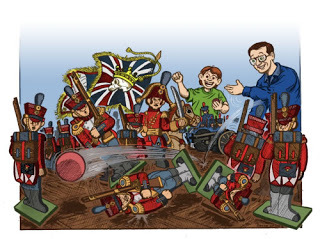 Tom is producting Napoleonic and Victorian Colonial laser etched wooden figure flats to go along with the rules through his Skull & Crown company. My daughter & I both have these beautiful figures, but haven't put them together yet. So instead, we decided to use some Britian Ltd's Deetail medieval figures I'd gotten her for Christmas. 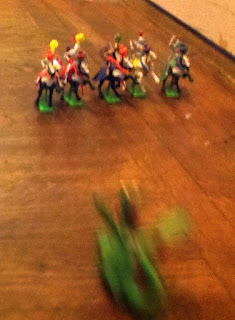 We split up the figures evenly, 5 cavalry & 9 infantry each, & set aside the Dragon figure for special use later. 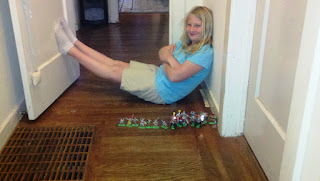 Here is the opposing general with her forces arrayed. Movement is done in Baton lengths, with infantry moving 1 Baton or firing & cavalry moving 1 Baton & firing, or 2 Batons with no fire. The Batons we used are from the Wooden Wars range. 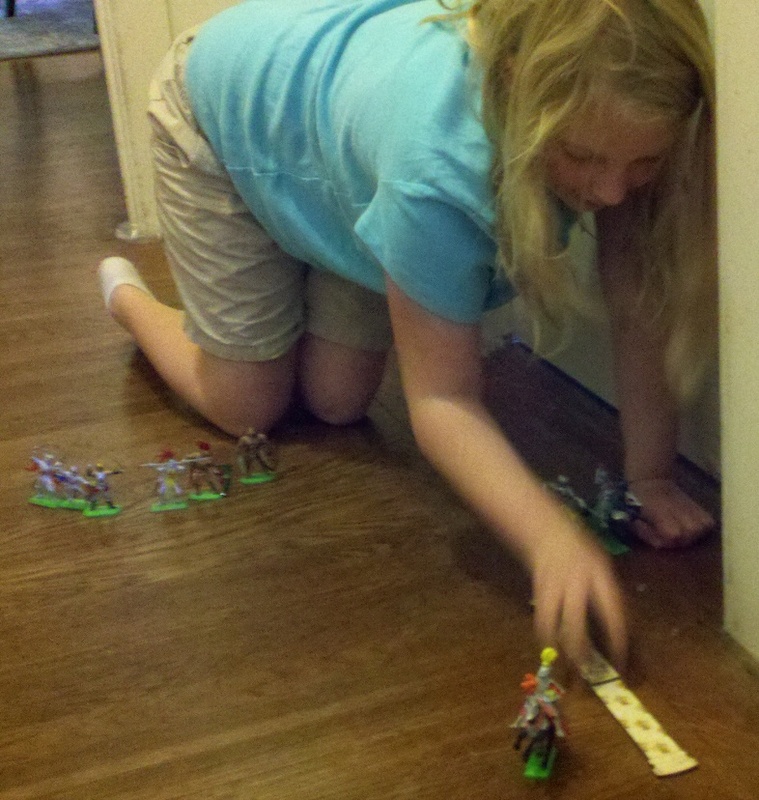 Wooden Wars is geared towards Horse & Musket armies, tossing rubber balls when firing to knock down the opposing figures. But since we were playing with Medieval figures, we just pretended the cavalry & infantry were really good with thrown spears. Each unit can toss 1 rubber ball at the enemy & any figures it knocks down are removed as casaulties. 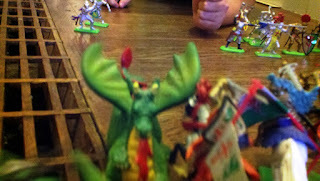 Here I am lining up my shot, but the enemy is correctly unconcerned. My 1st 3 balls bounced well over the heads of her infantry. The Dragon figure actually has pull-back & go wheels on it. 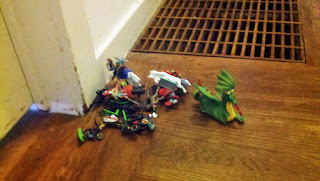 So we decided we could each use the Dragon once, & any figure it touches is removed. 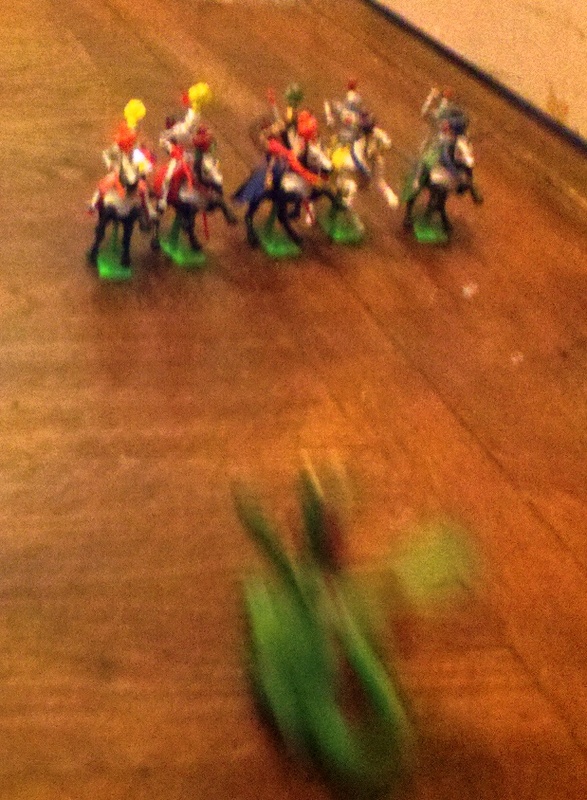 Here is the Dragon as it cuts a wide swath through my cavalry, removing 3 of the 5 figures. My cavalry made a desparate charge against my daugther's untouched unit of infantry, but 2 mounted knights against 9 men-at-arms went pretty much as you'd expect it. Here is the Dragon guarding my mounting pile of dead, after adding my last 2 knights. 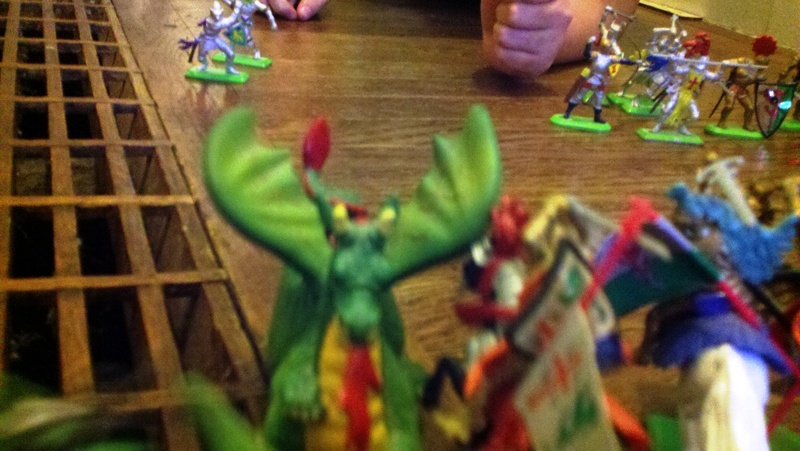 I released my Dragon in hopes of holding off a cavalry charge, but the Dragon only took out 2 knights. The rest of the cavalry charged in & took out all but one of my infantry. My remaining figure boldly stood his ground, firing rubber balls to little effect, as my daughter's infantry marched across the field of battle & finally cut him down. It was a very fun game & my daughter was very excited about beating me. 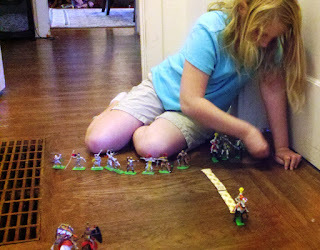 It also introduced her to the concepts of measuring figure movement, making fire vs move choices, & rolling dice for combat resolution (used in melee). 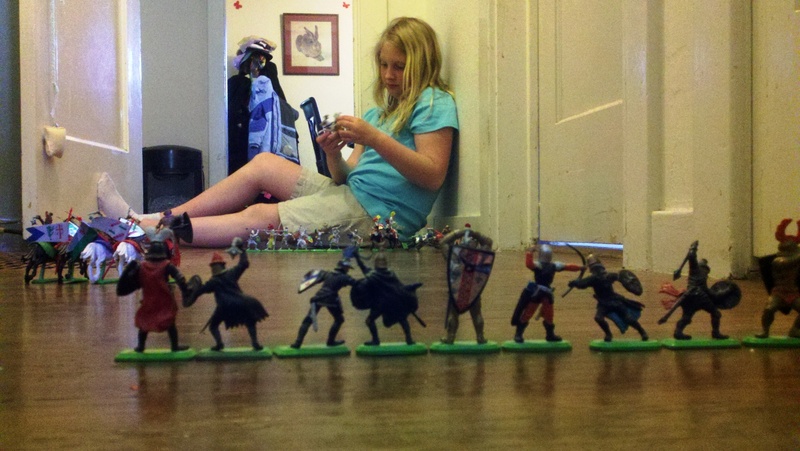 Hopefully once we put together our Wooden Wars Napoleonic armies, she'll be even more interested in playing. Splendid! Although I am not sure how to make a working dragon in wood yet!